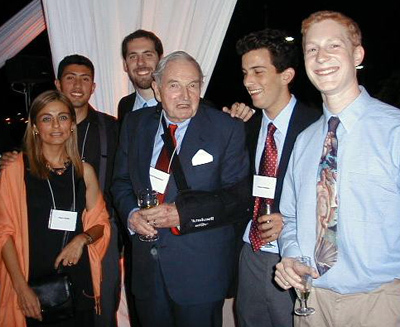 David Rockefeller meets Harvard students studying in Chile in 2003. David Rockefeller ’36, G ’37, LL.D. ’69, has made a $100-million gift to Harvard, the largest by an alumnus in University history. Reflecting the convergence of his own lifelong interests and current Harvard priorities, the gift will support two broad initiatives. The first is international experiences for students—in particular, aiding undergraduates venturing abroad, and underwriting innovative faculty-developed classroom and other programs with an international component. Rockefeller has designated $70 million for these purposes. The second is the arts—particularly engagement with visual arts, in the form of the Harvard Art Museum’s new study centers (to be created during the wholesale remaking of the Fogg complex, a multihundred-million-dollar renovation expected to begin in 2009). Some $30 million is devoted to this project and related arts programming, as a task force appointed by President Drew Faust explores the place of the arts in the curriculum and across the institution (on the Fogg, see “Art of the Future?” May-June, page 60; for the task force’s mission, see “Approaching the Arts Anew,” January-February, page 59). The gift was announced on April 25, in time for a dinner meeting of the Committee on University Resources—Harvard’s leading philanthropic supporters and fundraising volunteers. 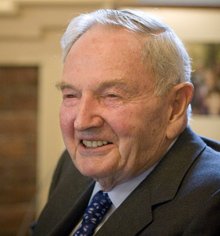 The news release (for the full text, click here) also noted that Rockefeller has previously given $40 million in gifts to Harvard, including $25 million to create the David Rockefeller Center for Latin American Studies (DRCLAS), for which he provided the initial grant in 1994 and, in May 2006, his most recent gift to the center of $10 million. Rockefeller, it noted, had been chairman, president, and CEO of Chase Manhattan Bank and chairman of the Rockefeller Group. His Harvard activities have included membership on the Board of Overseers from 1954 to 1966, and service as president of the board from 1966 to 1968. As Rockefeller explained in his Memoirs (2002), his engagements with Harvard, with the world, and with art began early in his life, and have been constant themes ever since. “Mother strongly influenced my choice of colleges,” he wrote. “[She]…wanted one of us to go to Harvard,” the school of her favorite brother, Winthrop Aldrich, A.B. 1907, LL.B. 1910. “I was her last hope”—a hope fulfilled when he enrolled in 1932. By that time, he had seen more of the world than most Americans: a 1927 trip to France; a 1929 family journey to the Middle East, depicted in a photograph in the book, including a Nile expedition, a stop at Megiddo (now in Israel), and then on to Damascus. During the summer following his freshman year, Rockefeller studied abroad, living in Munich to master German (one of the two modern languages he needed to fulfill Harvard requirements at the time)—and so got his first glimpse of Nazism on the rise. His host family took him on weekend outings to study Bavarian art and architecture, further developing an interest already influenced by his father’s collections and his mother’s leading role in creating the Museum of Modern Art (MOMA). In the book, Rockefeller devoted one chapter, titled “Proud Internationalist,” to “my lifetime pursuits as an internationalist” (in the era before “globalization” joined the popular vocabulary), and another to his lifelong travel to and involvement in the world “South of the Border.” That exposure, he wrote, has ranged from a second honeymoon in Mexico in 1946 to high-level work as a banker and policymaker promoting economic development and cultural interchanges during Latin America’s decades of political turmoil and debt-fueled growth and financial upheaval (“a miasma of confrontation and suspicion”), followed by democratization and private-sector expansion, and now less certain prospects. He also examined the region through the lens of brother Nelson’s “Good Neighbor” programs (at the behest of President Franklin D. Roosevelt) and fellow Overseer John F. Kennedy’s Alliance for Progress. His own work with intermediary institutions has encompassed everything from recommending new economic strategies that national leaders in the region might adopt, to helping introduce Americans to “the diversity, beauty, and sophistication of Latin American artists, musicians, and writers” (for example, subsidizing the English translation of Gabriel García Márquez’s One Hundred Years of Solitude). So it was that Rockefeller found himself agreeing with then-new Harvard president Neil L. Rudenstine in 1991 that “the vast majority of Americans knew little about their closest neighbors, and relatively few American universities provided their students with much more than a superficial introduction to Latin American history and culture. Even Harvard was derelict in this regard.” From that meeting of the minds came the idea for a University-wide Center for Latin American Studies. Rockefeller provided the initial funding—as well as models for engaging leaders from the region to invest their own time, energies, and resources—and at Rudenstine’s suggestion, the center bears the founding benefactor’s name (see www.drclas.harvard.edu). Rockefeller has since cited it—among the many institutions he has helped create or lead—as the one whose progress he has found most satisfying and enjoyable. Although thesis-research fellowships and grants from University regional and international centers support some of this travel, many of the programs cost students and their families a few to several thousand dollars. And participants, of course, lose earnings from summer jobs that might help defray other expenses at Harvard or elsewhere. Rockefeller’s new gift goes a long way toward making international experience need blind, as are College admissions and financial aid during the academic year. Depending on students’ programs and their financial requirements, these funds will support as many as several hundred international student experiences annually, making the goal of universal access to this part of a Harvard education practical for the first time. Other elements of the Rockefeller gift will help pay the costs of developing suitable experiences for the students newly enabled to take advantage of them, and of encouraging professors to develop courses that meld classwork with travel to relevant international sites, thus bridging students’ programs of study and their international experiences far beyond the Harvard campus. Finally, the Rockefeller funds will support the infrastructure—the Office of International Programs (www.fas.harvard.edu/~oip) and the Office of Career Services—that undergirds the creation of productive international opportunities, and the placement and care of students pursuing them. Beyond his aesthetic engagements, Rockefeller—the catalyst for Chase Manhattan bank’s lower Manhattan headquarters, a key force behind the creation of the World Trade Center—understands the practical details of museumship: hence, MOMA’s Museum Tower expansion, for instance. So it seems fitting that the second element of his Harvard gift is a major boost to the Fogg renovation and the reconfiguration of the University’s three art museums—one of the nation’s largest collections, and pre-eminent teaching institutions as well. The new study centers and seminar rooms will be the centerpiece of the museum’s efforts to bring students and their teachers into direct contact with important works of art. Rockefeller’s support is the first announced for what promises to be an expensive, intricate effort expected to take as long as five years. A smaller fund will support implementation of future recommendations by the president’s arts task force, possibly involving fellowships for student artists, expanding visits by performers to campus, and longer artistic residencies at Harvard. Rockefeller’s gift to Harvard equals two other gifts he has announced in recent years; $100 million each to Rockefeller University, the scientific research institute in Manhattan, and to the Museum of Modern Art. His family has long been associated with both institutions and, throughout their philanthropies, with education, learning, and the dissemination of culture. In a way, his landmark $100-million gift to Harvard puts Rockefeller’s signature on another institution—where this time, the tradition of family engagement began squarely with him. For that contribution toward what he called “a wonderful life,” Rockefeller has now made a remarkable repayment.